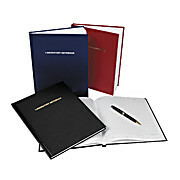 100 Page Lab Notebook, 1/each, Black, Grid Page Format. Numbered Pages include spaces for Title, Project Number, Book Number, Date and Witness Signature. Water Proof, Chemical Resistant Cover with Periodic and Conversion Tables in the back, measures 8.